Land Of The Gummies is excited to introduce Emoji Gummies to their ever-growing line of delicious Gummies. Emoji’s are being used a lot these days as a way of expressing a feeling. What better way to show how you feel then with a delicious gummy emoji! 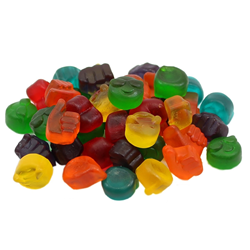 Land Of The Gummies is excited to introduce Emoji Gummies to their ever-growing line of delicious Gummies (http://www.landofthegummies.com/products/emoji-gummies-assorted-fruit-flavors/). The Emojis join the mouthwatering line-up of Land Of The Gummies® unique and delectable gummy delights promising flavor and fun in every sweet and chewy bite. Emoji Gummies join the world of Land Of The Gummies featuring the highest quality ingredients with premium tastiness and appetizing appearance. The popularity of Emojis in daily life allows everyone to express themselves from social media to text messaging and emails, and Emoji Gummies are ready to join in the conversation. Emoji Gummies highlight the 2015 Oxford “word of the year” - the Emoji Face with Tears of Joy – and is joined by the entire family of beloved Emojis adored by the world and included in Land Of The Gummies® collection. They are certain to become a fast consumer favorite. Land Of The Gummies is pleased to present Emoji Gummies to wholesalers and retailers who promise to deliver tasty, premium quality gummies to their customers. These fun gummies are made from the finest ingredients available – to help fans of gummies everywhere communicate their feelings in a fun, friendly, and yummy way. Land Of The Gummies is headquartered in Pennsylvania with worldwide state-of-the-art manufacturing facilities supporting their mission of delivering the world’s most extraordinarily delicious gummies made with only the best ingredients and highest quality standards. Land Of The Gummies helps retailers offer their customers gummies crafted with care, including healthier, natural ingredients and superior quality - all presented with Land Of The Gummies’ promise of Quality, Integrity, and Enthusiasm. “It is very exciting for us to have a new and unique product such as Emoji gummies to add to our line-up of already unique gummy products. Emoji’s are being used a lot these days as a way of expressing a feeling. What better way to show how you feel then with a delicious gummy emoji!” – Edward Weaver, Co-Founder - Land of The Gummies. At Land Of The Gummies, succulent Emoji Gummies proudly join the luscious candy collection of flawlessly sweet and flavor-filled Gummies available in an amazing assortment of sizes, shapes, and flavors sure to please each and every Gummy lover. Visit http://www.LandoftheGummies.com today and express your love for gummies with brand new Emoji Gummies – flavorful, colorful, and fun to eat. Land Of The Gummies promises Emoji Gummies will charm your customers and let them share their feelings as they relish their favorite candies. Bio: Land Of The Gummies began its quest to make the best gummies available in the marketplace, delivered with unmatched quality and price for wholesalers and retailers to pass on to their gummy-loving customers. With the latest addition of Emoji Gummies, their gummy collection continues to expand with a multitude of fun shapes and tasty flavors. Land Of The Gummies has grown a loyal following that grows daily among gummy fans everywhere! Visit http://www.LandoftheGummies.com and construct your list of must have gummies designed to enhance your wholesale or retail business.